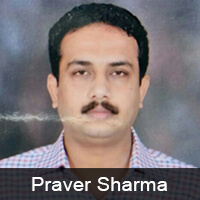 Praver Sharma is a veteran of the Media Industry with more than two decades of experience. He has worked in diverse roles such as Executive Editor, Bureau Chief, Staff Correspondent and many other key positions throughout his career. He started his career with the Indian express and has since then worked with leading brands in the industry like DD NEWS, ZEE NEWS, Pragya TV and most recently with bharatkhabar.com. He has been a Government accredited journalist for the last 14 years, and is currently working as the Executive-Editor-News for bharatkhabar.com, a leading news provider for India and the South-Asia region.